Our Southwest Florida Fishing Captains have stepped up to the plate with some super offers for the service men and women who are on leave in the area. Fishing charters are limited to a single charter from only one of the contributors shown below during the 2-week period. Our captains and guides are able to offer this benefit by sharing the load among themselves. In many cases, the contributors have cancelled or rescheduled trips with paying customers so please let them know if you have to cancel your scheduled trip. If you are planning an OOA Fishing Charter, several US Senators and US House of Representatives might enjoy going along with you. If this is OK, please contact us ASAP with your dates. Endless Summer Charters offers a 1/2 day fishing or sightseeing charter for a family (up to 4) of a service man or woman that qualify for OOA in the Fort Myers area. 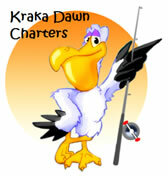 My name is Captain Kosch (Dave Koschara), owner of Kraka Dawn Charters. I would be proud to provide a free full day fishing, shelling, or site seeing trip on my 24′ Scout Bay boat to any active military person and guest(s), 2-3 people. I have fished the area for over 20 years. Included is a nice lunch either at a local restaurant or my home made lunch on the beach/water. I am a licensed USCG Master Captain and would supply all bait, tackle, and licenses. I belong to both the Cape Coral & Ft Myers Beach Tarpon Hunters Clubs. I am available from Dec 1 to Jun 1. In the summer & fall, I fish for large Browns, Steelhead, & Salmon. I would be happy to take someone down the river in my drift boat for another unique fishing experience. FishSkinner Charters would like to donate a 1/2 day back bay fishing charter, valued at $350.00 to any man or woman along with family members who are currently serving our country on combat leave. Up to 3 passengers. Local Firefighter would like to invite any active service men or women and their famlies to join me for an afternoon or sunset cruise aboard my 36 ft House boat. Cruise the coast line and back waters of SW Fla. Fishing, swimming ,shelling, snorkling, Scuba diving, whatever your pleasure. Bring a lunch or cruise to a local waterfront dining spot. I have a 21 ft bayboat with 150hp and I do mostly inshore fishing. I Can go anytime depending on conditions. I would be happy to provide gear bait water or soda ( we call it pop in Minnesota) for up to 3 anglers. Available through late April. Through this program we can provide a free full day offshore fishing trip for 4 active duty military personnel on leave from the Iraq/Afghanistan war. The B & G is a 33ft World Cat T.E. We provide all bait, tackle and License. Valid military I.D., temporary leave documents and DA-31 are required. We operate our charter on the weekends out of Port Hudson Marina, located in Hudson FL. Contact us for Details. Capt. Dan, would be honored to provide any of the service men or women that wish to enjoy a day on the water seeing mother nature’s creatures as she intended. Capt. Norm, a retired Coast Guard veteran is offering a free 1/2 day charter – near shore/inshore fishing or sightseeing trips – for a military member and family (up to 4 people) aboard his 23ft boat. Capt. Chris, a veteran of the Navy and Army National Guard, is offering a free 1/2 day charter – inshore fishing – for a military member and family (up to 4 people). Fish Tale Grady Club of Ft. Myers Beach offers a day of fishing or cruising with one of their boat club members. Contact them at (908) 507-7060. 6 hour, Tampa Bay Inshore fishing trip for 2 anglers. Captain Little Jim Fesperman is a former Navy CB, All you need to bring is hat, sunglasses, and a desire for a little r and r on beautiful Tampa Bay, everything else is provided. Departure will very depending on where the fish are biting and the weather, from either the Gandy, Crisp Park, Fort DeSoto or Simons Park Ramp. We will target the main inshore species of Snook, Redfish, Trout and maybe Snapper, Grouper and Sheepshead. At least one angler must have Official Orders directing the service member a return to their foreign assigned post. Government document labeled DA-31. Upon presenting proof of service and temporary leave documents we will be ready to shove off and go fishing. Captain Mark King, Reel Dreams Guide Service, offers a free 1/2 day (4 hours) guided fishing trip on Lake Okeechobee for largemouth bass. The offer is for up to 3 persons. Military ID required. Captain Larry Hendricks, Tall Tails Charters, offers a free 1/2 day charter to military personnel on leave from active duty in the Persian Gulf/Iraq. The Getaway Marina would like to offer 1 free “Inshore Charter” and 1 free “Offshore Charter” on the 90FT “Getaway (AC, Full Galley, and all equipment and license furnished on all OOA Charters) for all active military with valid I.D. Call the Getaway Marina direct 1-800-641-3088 or email us for your reservation today! Florida Fish & Dive Charters would like to offer military personnel deemed eligible by OOA, a half day charter in the waters off Ft. Myers/Pine island. This would include; spearfishing, fishing, or recreational diving. At this time we can only accommodate 3 people per trip. Capt. Fesler offers a soldier and his/her family a full day charter out of the Tarpon Springs area. If the family would like the day could be broken up by having lunch at an on-the-water restaurant (at the family’s own expense). Everything else will be supplied including ice and drinks. The number can be 3 soldiers or a family of 3 (kids are welcome). Please make your request a week in advance to make sure the date is available. Mike has a 20 foot flats boat and fishes the local flatsmasters fishing tournaments. He is willing to take any of our military guys or girls fishing when they are home on leave. He is located in Cape Coral but lived in Punta Gorda so going out of either location is ok. He can seat up to 3 people not including himself. This fishing is usually targeting snook, redfish, and trout. Capt. Zinke would be happy to donate a fishing or sightseeing trip for up to three persons including an “Operation Open Arms” Honoree aboard the “del Rio”, a USCG Licensed 27 ft. Stamas. All bait & tackle will be provided. First Mate & Chef Patzie will provide lunch upon request. Capt. George offers fishing charters. 1/2 day fishing trip for up to 3 soldiers. Day of backwater fly or spin fishing for snook, tarpon, redfish. 1 or 2 people, in the Everglades National Park, Everglades City. Tackle and license is included. Free fishing or sightseeing in the fabulous Ten Thousand Islands. I can accommodate 1-2 people. We depart from Calusa Island Marina in Goodland (SE corner of Marco Island). Offshore fishing trip aboard the Miss Max departing from Pine Island Sound for up to 4 passengers captained by Captain Steve Woodard. All expense paid fishing trip offshore. Back bay fishing or sightseeing for 3. 16 foot HEWES Redfisher for 1 or 2 people for a day of fishing Charlotte Harbor/Lemon Bay areas. I will provide boat transportation for the military sponsor, spouse and children (over 6 years old) to one of the local waterfront restaurants (such as The Waterfront in St. James City) on my 25′ Contender. Available weekday evenings. Contact me for scheduling and details. It would be an honor for me to offer a FULL DAY OF FISHING The Naples/North Marco Island area to a soldier from The Iraq or Afghanistan War. Free 1/2 day tarpon or musky fishing tournament for soldier and one other when on leave from combat zone. A free half Day charter. Guided fishing trips aboard the BarHopp’R (subject to availability during the busy season). A free 1/2 day fishing trip for up to 3 soldiers visiting the Merritt Island, Cocoa Beach area during their leave. Fishing will be in the Indian or Banana Rivers from a 22 Foot Pathfinder Bay Boat. God Bless Our Troops. 1/2 day fishing for snook and redfish in Estero Bay on a 19′ Hewes – 2 or 3 people. A half-day (4-hours) of fishing, shelling or sightseeing trips. Limited to 2 people. All tackle included on fishing trips. I’m delighted to see this program for such deserving people. As prior military, I recognize what these folks have done for us. I’d like to invite any soldier to come fishing with me through this program. I have an all-inclusive inshore fishing charter business and would love to be a part of your program. I participated in a Take A Soldier Fishing tournament held in the Tampa Bay area a few years back. It was great. I’d love to see that tournament return. Anyhow, I’m in the Tampa Bay area if you have any soldiers who’d like to do some fishing. Their families are invited as well. I can handle up to 4 anglers. I run backcountry fishing charters in the Boca Grande/Englewood, Florida area. I have an Action Craft 1890 and can take up to three people. I am offering a 1/2 day fishing charter. All fishing tackle and license is provided. My focus is fly fishing between the months of November to May. Free 1/2 day fishing charter. Join a group for a fun day of sport fishing with Captain Greg aboard the Blind Faith or Miss Kristin. Blind Faith is a 41 foot Markley with top of the line electronics. Captain Chuck has spent his entire life fishing on the Chesapeake Bay. He has a 46’ boat and invites you to join him and a group for a great day of fishing. Captain Chuck asks for one week notice. Call Captain Wayne for a perfect day on the Chesapeake for fishing and crabbing. Please give a 2 week notice and keep calling for availability.